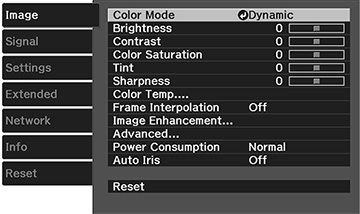 Settings on the Image menu let you adjust the quality of your image for the input source you are currently using. The available settings depend on the currently selected input source and resolution. Note: The Brightness setting does not affect lamp brightness. To change the lamp brightness mode, use the Power Consumption setting. Note: You can select the Frame Interpolation and Noise Reduction settings only when the Image Processing setting is set to Fine.